You can duplicate an assignment in your course. When an assignment is duplicated, the word Copy is added to the end of the assignment name. If a differentiated assignment includes an Everyone Else date, the copied assignment retains the Everyone Else due date, if any. If a differentiated assignment does not include an Everyone Else date, the copied assignment does not include a due date. Assignments currently cannot be duplicated for quizzes. Except for Quizzes.Next assessments, assignments configured as an external tool (LTI) submission type cannot be duplicated. Locate the assignment you want to duplicate and click the Options icon . Click the Duplicate link . View the assignment duplicate in your course. 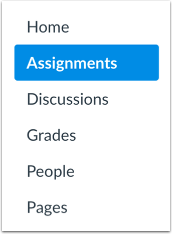 Note: If applicable to your course, the Assignments page displays any Blueprint Course or Sync to SIS icons after the page is refreshed. Previous Topic:How do I delete an assignment? Next Topic:How do I assign an assignment to everyone in a course? Table of Contents > Assignments > How do I duplicate an assignment? Re: Why does "duplicate" not appear as an option for my assignment? Re: How do I make a copy of a quiz?